Twitter has become the go-to channel for many people to connect with a business or service provider. They turn to Twitter because its public, real-time and conversational nature means that many brands are available and ready to help—or at least they should be. Research shows that providing exceptional customer service on Twitter impacts the bottom line and has the potential to lead to customer satisfaction ratings of over 90%. Recognizing this enormous opportunity and the need to effectively quantify customer service efforts, Sprout worked closely with Twitter in 2016 to integrate Twitter Customer Feedback and provide early access to a select group of Sprout customers. We’re excited to announce that Twitter Feedback and the Twitter Feedback Report are now broadly available in Sprout’s Advanced plan. Starting today, Sprout users can enable and configure Twitter Feedback surveys from the new Customer Care Settings screen. Through early access, a handful of Sprout customers—including Monarch, Evernote and Liverpool John Lennon Airport—have already been using Twitter Feedback to gather customer satisfaction ratings and direct feedback through a simple, automated Direct Message survey. In the case of Monarch, the results speak for themselves. The airline boasts an average customer satisfaction rating on Twitter of 8.8 out of 10 which translates to a Net Promoter® Score of 50—this is an outstanding score in general and particularly impressive in the airline industry. What’s more, they’re seeing a 63% completion rate on these surveys compared to average response rates that rarely go above 20% when delivered through traditional channels like phone or email. Now, we can really start to measure social care and benchmark Twitter against our other channels. For Monarch, gathering this data is easy. At the conclusion of a service-related conversation, Monarch agents simply click the “Send Feedback Request” button from Sprout’s Twitter reply screen. The survey provides a structured way to gather valuable insights that have helped Naomi Bressan, Social Media & Content Executive at Monarch secure executive buy-in to invest in social as a prominent customer service channel. “The board is seeing statistics that they’ve never seen before. Sprout’s reports have completely changed our team leaders’ view of social,” said Bressan. For travelers communicating with Monarch on Twitter—whether they’re rushing through the airport or Tweeting from the comfort of their home—the experience is straight-forward and painless. A single question meets them in the same place where they just experienced a service interaction with Monarch—on Twitter—and allows them to provide direct feedback in the moment. With Sprout’s Twitter Feedback Report, we’re able to quantify our customer service efforts on Twitter in a way that previously wasn’t possible. 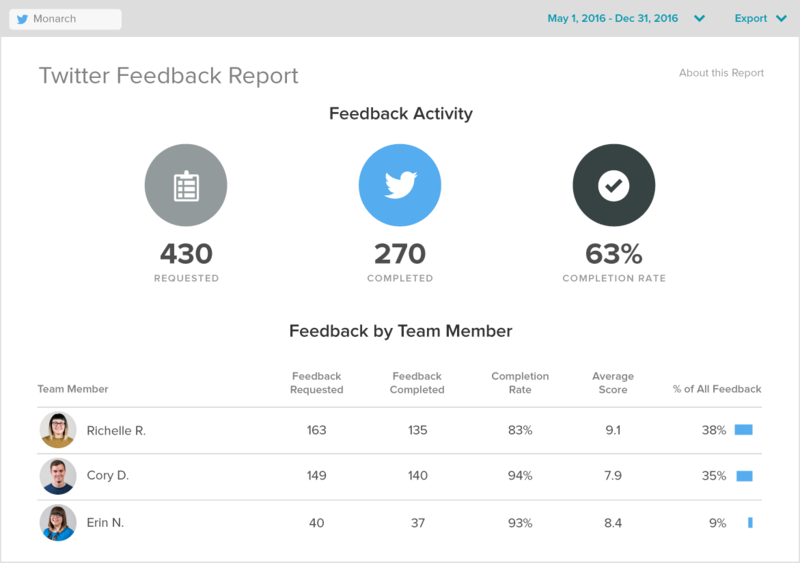 To complement the survey workflow, the new Twitter Feedback Report aggregates all customer satisfaction ratings collected via Twitter Feedback survey responses and provides visibility into the individual scores and private comments as well as aggregate, trend and agent-level insights. For many businesses that already measure CSAT or NPS® ratings through other channels, bringing customer satisfaction data from Twitter interactions into the mix is a powerful augmentation. To learn more about how your social customer service team can use Twitter Feedback to better quantify customer satisfaction on Twitter, contact your Sprout representative or email sales@sproutsocial.com.